No Trick - All Treat! You are so awesome! Welcome to all the new readers of this blog, and thank you to the regulars for your continued support. I am excited to say that Rhythmic has been chosen as one of 4 finalists from THOUSANDS of nominations in the Craftsy Pattern Designer Awards. (There were 9, 774 patterns in the running!) Thank you SO MUCH for voting for my pattern. We are now down to the final round and I am asking for your support one last time. Kindly follow this link and click the radio button next to Rhythmic. 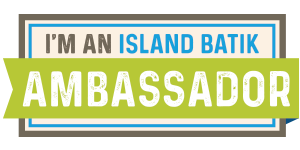 If you would like a chance to win a free class from Craftsy, then add your email address (not mandatory) Then click Submit. That’s it! My sincerest thanks…and good luck in the draw for the class! There is an energetic elf taking over production at the North Pole and her name is Jeanne Kaye. She's on a roll! 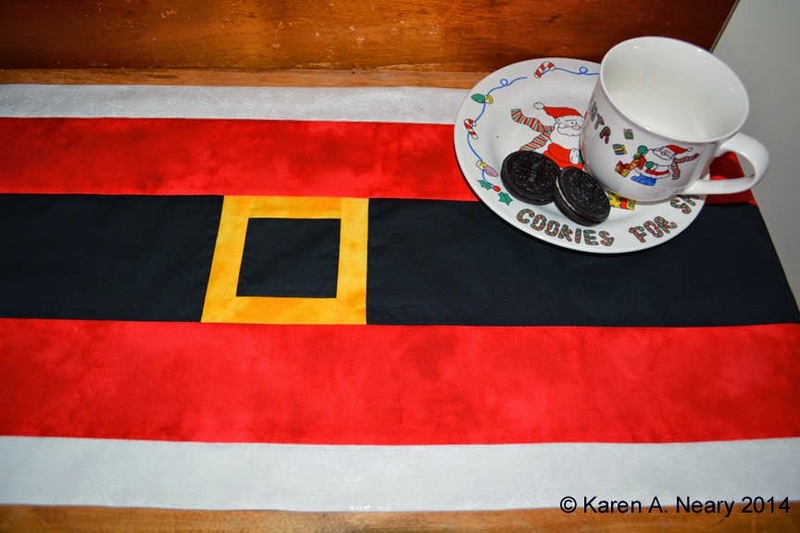 I'll share what Jeanne Kaye wrote because it's so much fun: "Here I am in Fredericton sewing Santa's belt in vast quantities, and it seems I have a shortage of plain red fabric! Not wanting to stop the production, I searched my stash and found a red with decorative touches, and then I found piece called "Santa's Beard" which looks a lot like fluffy fur. So I pressed on, and made this one. I've decided that this must be Santa's "dress" costume, for all the holiday parties that he probably attends after his busy night on the 24th. :-) Love the pattern; can't get stopped!" I am familiar with the "Santa's Beard" fabric she mentions, as Mrs, P. carries it in her shop. 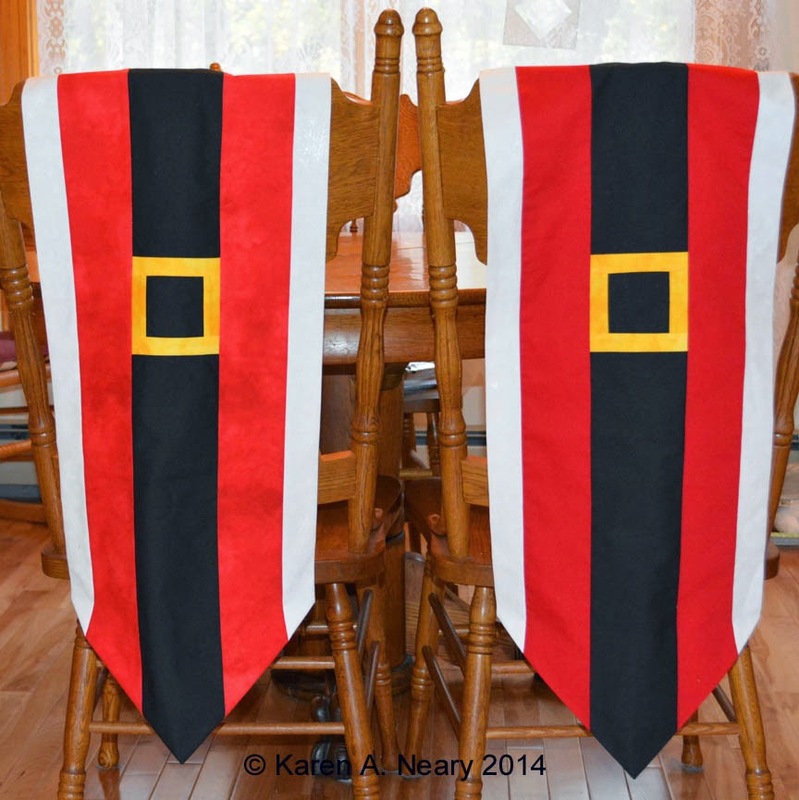 Thank you so much Jeanne Kaye for sharing your projects - keep them coming! The pattern can be downloaded here if you'd like to make your own. I was delighted to receive this photo from fellow fabric enthusiast and Amherstonian James Austin..He is shown here standing next to my Log Canada which is part of the Ruby Jubilee Red & White Exhibit in Houston, Texas. Thanks, James. This is way better than a postcard! Simply Santa is Simply Finished! Jeanne Kaye Speight from Fredericton downloaded the Simply Santa pattern about 45 minutes ago...and here's her finished runner! How many do you think she will get made by Christmas? :) Thanks Jeanne Kaye! You can download the pattern for Simply Santa here. 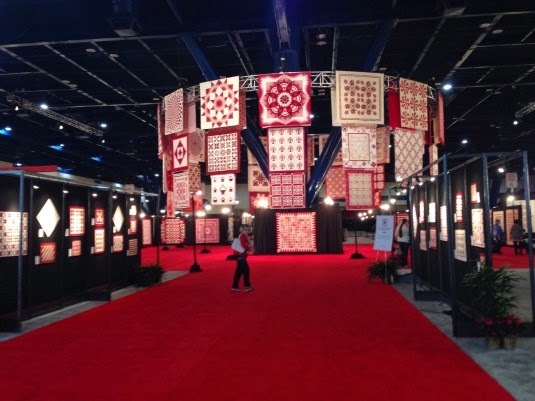 When this show ends, the quilts will travel for showings across the U.S.A., and return home in October 2015. 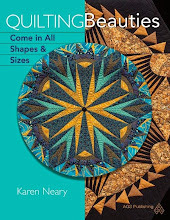 You can watch a slideshow of more pictures from this exhibit on the Quilt Show blog. It's almost November, so like you I am thinking ahead to Christmas and looking for ideas for quickly stitched gifts. 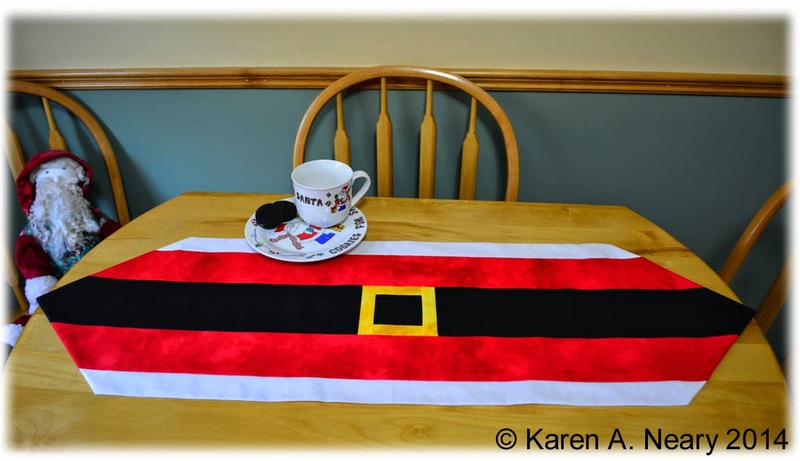 I had fun coming up with this really, really simple table runner. It doesn't take much fabric and the piecing is minimal. The bold, graphic design lends a touch of modern to a traditional motif. Because of the clever construction method used (similar to a roll-up pillow case) it is completely machine sewn - no binding, no raw edges - everything is enclosed, turned inside out and you're done! It was so quick to stitch that yesterday afternoon I had time to work out the measurements, write the instructions and make two runners. Once you get the hang of it, each should take no more than an hour (the second one took 30 minutes, start to finish). This "Santastic" pattern is available as an instant download from Craftsy for $2.50. Have fun! What an honour to have one of my original blocks included in an EQ program! 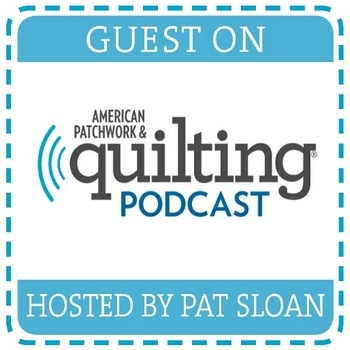 I have been a dedicated user of Electric Quilt since it first came out...and have upgraded to the newest version as each was released (we are now up to EQ7). I would never have imagined I would be part of this amazing software. I do all of my designing on EQ, including drawing piecing diagrams and templates....and it's so neat to hover my mouse over "Hidden Star" and see my name appear! 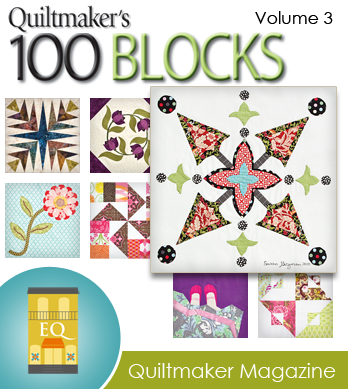 You can find all the "Quiltmaker's 100 Blocks from Today's Top Designers" here. An incredible number of you have downloaded my Rhythmic pattern through Craftsy (thank you! ); it stayed in the number one spot for an extended period and it is still going strong. I appreciate your support a great deal and ask that you will support me now in a way that could also benefit you - in the form of a FREE Craftsy class of your choice! and paste it into the field where it asks the URL on this page. All that's required to enter is an email address. Thanks, and good luck in the draw for the class! A big thank you to all who attended my quilt exhibit at the N.S. Fibre Arts Festival. It was great to see so many out, and I truly appreciate all the kind comments. My head didn't grow any bigger, but I think my feet swelled to twice their size; Beth warned me the concrete floor would be a killer and she was so right!! Yikes! Tomorrow is the start of the final week to prepare for our big festival. I am not even close to being ready. Fall is a super busy time in the quilt world as it is: guilds are back in session, and the pattern orders flood in as shops organize winter classes. Fabric companies are scrambling to get quilts made with their new fabric lines for Quilt Market later this month. I confess every year I shake my head and wonder whose idea it was to hold this festival in the week following Thanksgiving; certainly it wasn't a quilter (or at least not this quilter!) I had hoped to have 2 additional pieces finished for my "World of Beauty" display and both are close but not quite there. The miniature silk piece requires binding so it may actually make the show. Yesterday I got the Oriental piece basted and the stitch-in-the-ditch started. As you can see below, it's a very colourful piece.